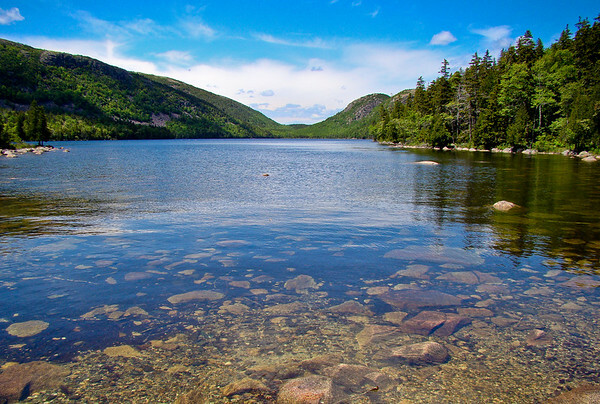 Jordan Pond is reputed to have the clearest, cleanest water in the east, and images like this tend to bear out the claim. This was taken from the small check damn at the southeast corner of the pond where, this day, water was flowing into the pond from the marshy area behind the dam. (I always assumed it was an outlet, but I guess not). It shows the full length of the pond, though the Bubbles are somewhat hidden behind the east shoreline. This is another low angle shot, taken squatting close the flowing water from the middle of the dam. Recovery in Lightroom effects the clouds and sky, as we were mentioning yesterday, but it also does a really good job of clearing a layer of surface reflections from water…making the water look more transparent. Added Vibrance and Clarity, and Landscape sharpen. Cropped at bit a the top for better horizon placement.